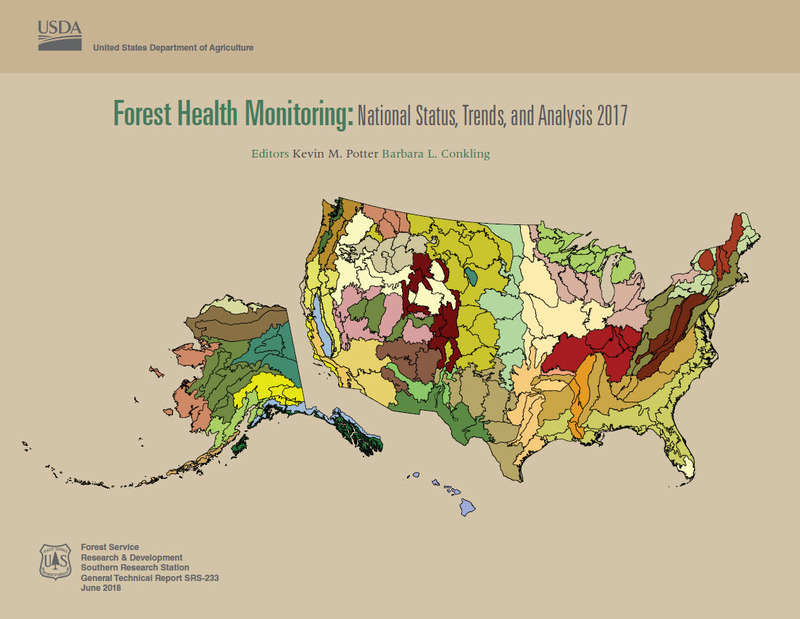 Annual report summarizes forest health across the U.S.
Forest Health Monitoring: National Status, Trends, and Analysis 2017 includes 15 chapters focused on impacts to forest health from disease, drought, fire, insects, and other stressors. 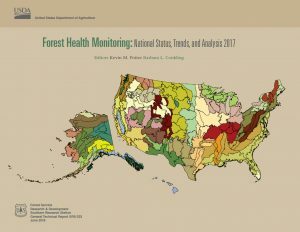 The report is the 17th such summary in a series sponsored by the USDA Forest Service Forest Health Monitoring (FHM) program and published by SRS. Potter co-edited the report with Barbara Conkling, also a Center cooperator and NCSU scientist. 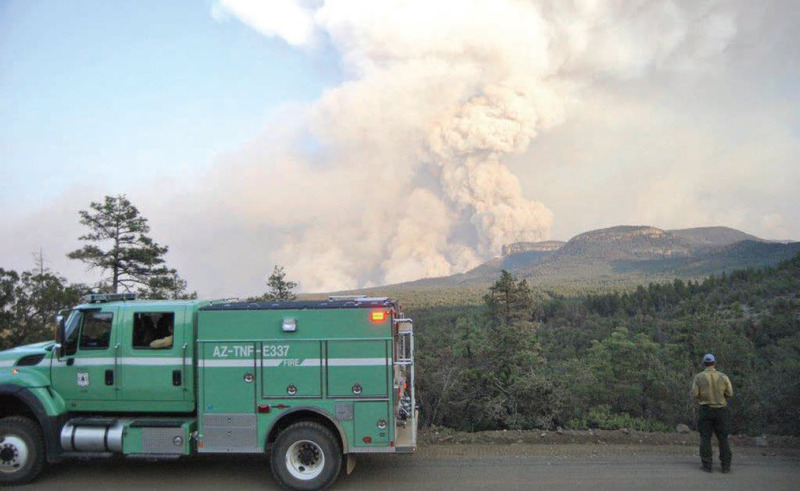 The Juniper Fire in central Arizona started with a lighting strike in May 2016. Photo courtesy of USFS, Tonto National Forest. 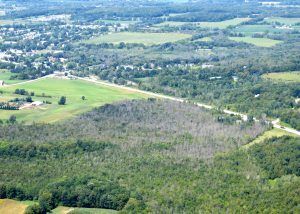 In 2016, 62 different mortality-causing insects and diseases were detected on nearly 7.4 million acres across the lower 48 states, and 63 defoliation-causing insects and diseases were detected on close to 5 million hectares. Bark beetles were the major causes of mortality in the West, especially in California, Oregon, and Colorado. Emerald ash borer was the most important cause of mortality in the East, especially in Wisconsin. Overall, the number of satellite-detected forest fire occurrences in 2016 was the lowest since 2006. However, some areas had high concentrations of fire occurrences, with the highest concentrations detected in central and southern coastal California, Idaho, southern Georgia, and central Arizona. Drought affected a significant portion of the nation in 2016. Much of the interior Southeast had extreme drought, while parts of the Northeast and the Interior West experienced severe to extreme drought conditions. Drought conditions were conspicuously absent from California after several years of extreme drought. Crown dieback in ash trees attacked by the emerald ash borer. Photo by Bill McNee, Wisconsin Department of Natural Resources, courtesy of Bugwood.org. Because the Forest Inventory and Analysis (FIA) program collects data every 10 years on plots in the western U.S., the 2017 FHM report includes, for the first time, an analysis of tree mortality in the West based on FIA data. This analysis showed mortality exceeding growth in many places. In central Idaho, western Montana, central Colorado, northeastern Utah, and southern California, mortality rates were two to four times those of growth rates. An assessment of tree crown dieback from FIA plots indicates that current crown dieback conditions for most eastern species are within expected norms. Notable exceptions are ashes and elms impacted by an insect and disease, respectively. The crown dieback assessment also showed high mortality for several western species, including lodgepole pine, quaking aspen, and subalpine fir in the Rocky Mountain region. In addition to these findings, the 2017 FHM report presents results from several FHM-funded studies of undesirable changes in forest health in subregional areas. Topics include status of whitebark pine, post-wildfire impacts on soil carbon and nitrogen, post-hurricane fuel dynamics, laurel wilt disease impacts, and much more. Each chapter of the 2017 FHM report can be downloaded individually, or the entire report is available from Treesearch. Prior reports dating back to 2001 are also available for download. Potter and Conkling are now working with authors to develop the 2018 FHM report, which is expected to be published in early 2019. For more information, email Kevin Potter at kevinpotter@fs.fed.us.